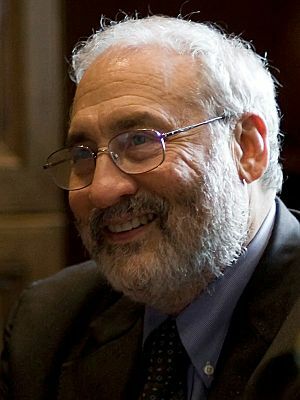 Joseph Eugene Stiglitz, ForMemRS, FBA (born February 9, 1943) is an American economist and a professor. He works at Columbia University. He won the Nobel Prize in Economic Sciences (2001) and the John Bates Clark Medal (1979). He is a former senior vice president and chief economist of the World Bank, and is a former member, and Chairman of the Council of Economic Advisers. He is known for his critical view of the management of globalization, free-market economists (whom he calls "free market fundamentalists"), and some international institutions like the International Monetary Fund and the World Bank. In 2011 Stiglitz was named by Time magazine as one of the 100 most influential people in the world. He is the author of several books, the latest being The Euro: How a Common Currency Threatens the Future of Europe (2016), The Great Divide: Unequal Societies and What We Can Do About Them (2015), Rewriting the Rules of the American Economy: An Agenda for Growth and Shared Prosperity (2015), and Creating a Learning Society: A New Approach to Growth Development and Social Progress (2014). Joseph Stiglitz Facts for Kids. Kiddle Encyclopedia.